There are several options for browsing while using the internet and There are several browsers available for browsing. To select the best internet browser is very critical. There are several criteria for choosing the best web browser like Speed, Security, App Support, Cross-Platform Compliance, etc. 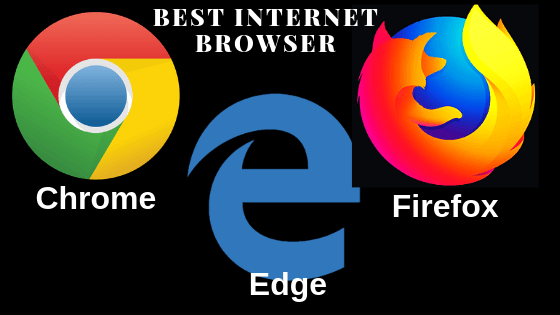 Choosing the best internet browser depends on your demands, every browser becomes its own appeal and unique features. Microsoft Internet Explorer is the best hardware acceleration, Google Chrome load web pages with fast speed, Firefox is known for its Add-Ons and security. Chrome is a lightweight and fast browser, which can browse any web page. Now it is a widely used browser. Chrome is available for Windows XP, 7 and 8, Windows 10 and is also available for Android. It supports all the major technologies and standards of HTML5 and Flash. To maintain a clean browsing experience. Chrome has built with the long list of extensions. You can select an incognito window with Ctrl + Shift + N key in which no history will be recorded. There is another feature in Google Chrome, which has the option of cloud print. If you have a cloud printer that you can put it in chrome and then you can print from anywhere with chrome. If you want a clean, fast, and stable internet browsing, then Chrome is a good choice. Here is a list of some useful, frequently used shortcut keys. You must have used internet browsers like Google Chrome and Opera for surfing the internet. If you use Microsoft Edge your laptop’s battery capacity to increase. Microsoft’s Edge Browser consumes very little power. Microsoft’s new browser Microsoft Edge saves a lot of battery over internet browsers like Google Chrome and Opera. If this browser was used on a laptop, its battery lasted about 7 hours, while on the same laptop it used to back up 4.19 hours after using Google Chrome. Microsoft Edge also offers a better extension experience. Mozilla Firefox is one of the world’s most popular open source web browser. Firefox has strong security features that protect against viruses, spyware, malware and fixing sites. Mozilla Firefox always provides auto-update, so you’re always up-to-date. Firefox comes with a simple interface it provides Google as the default search engine. Firefox has Pind Tab Features, which allows you to open your favorite web application with a click like Facebook, Gmail, and Twitter. Pind tabs are small and cannot be stopped by mistake and when you start Firefox this tab open automatically. In this tabbed browsing is better than Google Chrome, because Firefox supports Tabbar scrolling. If you open several websites in the browser, Chrome makes the tab size very small, but Firefox provides scrolling features using this feature you can scroll the tab. Firefox offers a better extension experience than Google. If you accidentally closed the Firefox window, no need to worry, you can restore your previous session by simply clicking the Restore Previous session button. Internet Explorer is easy to use and this is the default browser in the Windows operating system. The Browser has Compatibility View which gives access to all the websites that are incapable and do not look good. The Web Browser also provides a list of add-ons for a fully customized browsing experience, but it does not have an integrated download manager. Internet Explorer protects your computer against spyware, viruses and phishing sites. How to boost the speed of Google Chrome Browser with SpeedyFox?